It’s that time of year when teachers all across New Zealand are finalising their inquiries and having appraisal or GROW coaching sessions. What is one of the better ways to collect and curate samples of your practice and inquiries? And how can these be aligned with the new Teaching Standards? Using Google Blogger is not only a great way to reflect on your practice but it also offers an efficient way to align samples of your practice with the Teaching Standards. I have seen many teacher blogs which are done on Google Slides or Sites but the limitation with these is that you cannot search your evidence with the Teaching Standards as a filter. 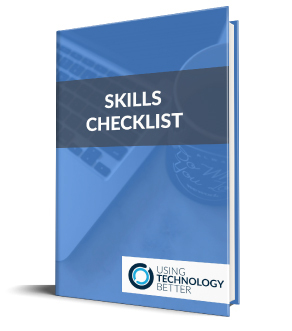 By creating the Teaching Standards as labels each Blog post can quickly be aligned with various standards. You do not need one piece of evidence for each standard. One blog post can provide evidence for many standards. There are a few ways of adding labels but in this instance, it’s easier to add all the teaching standards at once by adding labels inside a New Post. Now each time you write a reflection, upload a resource or record your inquiry, you can simply add labels. When you or someone else is viewing your blog they can then search by the Teaching Standard labels. Also when you are filling out the Teacher Registration form you can use this function to jog your memory about how you have met the standards. Now that you have created your Teaching Standard labels you can select and add them to blog posts in two different ways. While writing a new post go to where you added the labels, under ‘Post Settings’. You will see that they are now saved under the Labels box. Click each of the labels which apply to your new post and they will be added. You can also add new ones as needed. About You: Explain who you are and your teaching philosophy. Teaching Standards: If you are ever thinking about working overseas it might pay to have a section explaining the NZ Teaching Standards. Student Surveys: A great way to collect student voice and demonstrate reflective practice. Inquiry Process: There are many variations of Teaching Inquiry. It might be useful for others to see what process you are using. More Labels: You can add other labels such as extra-curricular, STEAM, e-Learning etc. On the main Blogger Dashboard you will see the Pages option. Click this then create a new page and save it. You can create as many pages as you like and these are edited just like a blog post. I have not covered all the details of setting up a great blog but you can use the Google Support page to get started or make contact with me and request another blog post explaining the general set up. Part of reflecting on your teaching practice also involves using data so check out this great blog post to learn some ways of sorting data. 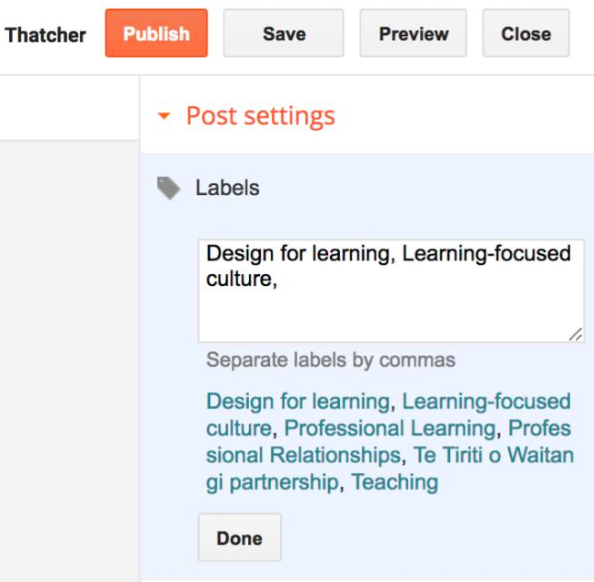 Have a go with using Google Blogger to record your teaching practice and use labels to align it with the Teaching Standards. 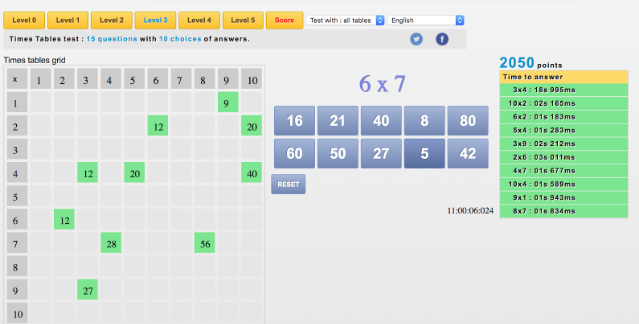 Do you want to use devices in your maths programme but don’t want your students playing any old maths games? Do you want the learning to be purposeful and targeted to your students’ needs? Read on to discover three sites that fit the brief. It’s always important when using technology in your classroom to consider the ‘value added’ effect. How is the technology adding value to the learning and what is it doing that you couldn’t do with just paper? Too often in maths programmes I’ve seen students going to websites and choosing a maths game, any game they like the look of. While there may be some value in what they were doing – more often than not there wasn’t. The games they chose had no relation to the skills they actually needed to build on, sometimes they achieved nothing (they got all the answers wrong) and usually, there was no evidence of what they’d been doing. Technology can definitely have a valued place in the maths programme, but there needs to be deliberate acts of selection that go into planning just which sites you want to direct your students to. Here are three sites you can use that allow for differentiated learning, instant feedback on progress and targeted skill practice. Your students can show evidence of what they’ve done by screenshotting their results and pasting them into a digital learning journal. 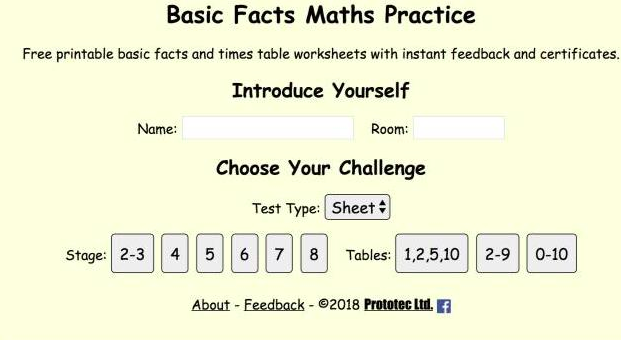 Prototec is an awesome site for practising maths knowledge. It’s based on the New Zealand stages, but can easily be used elsewhere also. We know how important this knowledge is and the role it plays in allowing students to successfully implement their strategic thinking. Students don’t need to add their name or their room if you don’t want them too – they can go straight to the practise activities themselves. 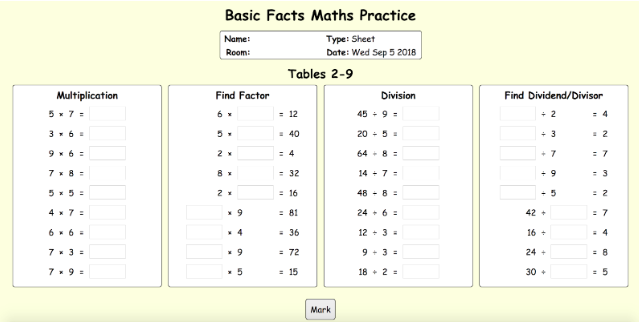 This site allows them to practise the knowledge needed for the various stages or they can choose to practise their times tables. They simply click on where they want to go. There are two options they can choose between – a sheet (as shown below) or a timed version if they want to race a clock. 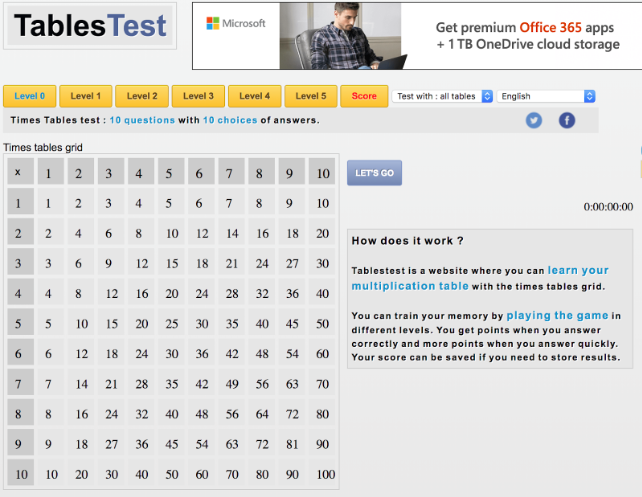 This site is purely for practising times tables. 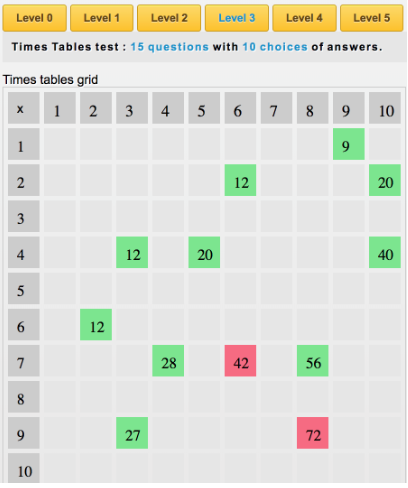 What I like about this one is that your students can choose the level – not the times table – they need to practise. It’s great for encouraging student agency and having those conversations with your students about taking responsibility for their own learning. Let them choose the level and then ask them to explain why they chose that particular one. 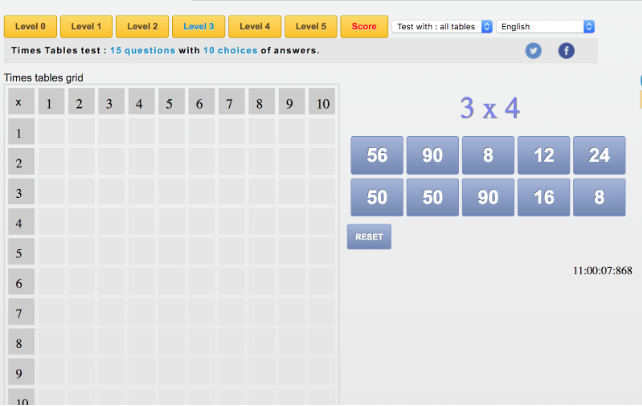 Once they choose a level, it generates random questions and they choose the correct answer from a selection given. If they answer correctly it pops the number into the array in the correct place – great for reinforcing their knowledge of how numbers arrays work also. Again, it’s instant feedback for them and they can see a list of all their correct responses. If they’re into competition they can see how long it’s taking them to answer and try to beat their quickest time. If they answer incorrectly it pops the correct answer into the array but colours it red – a very visual sign for them that this is a fact they need to practise. How targeted is that! They can create a list of specific facts they need to learn and focus on just those ones – without wasting time on the ones they already know. Once they have completed the activity, again, they can screenshot the results and paste them into their digital learning journal. Free Rice is a great site for practising times tables while helping others. You don’t need to sign up to use it if you don’t want to. The idea behind it is that for every answer you get correct, 10 grains of rice are donated to the United Nations World Food Program. Purposeful, targeted and helping others – what better practice could you get! There are 2 levels of facts your students can choose from, so it can be a differentiated activity. You need to answer the first question to then see the option to change levels at the bottom. If they get an answer wrong it gives them immediate feedback and tells them what the correct answer should have been. They then need to start again. It tells them how many grains of rice were donated from their efforts. This can be screenshot and added to their digital learning journal. 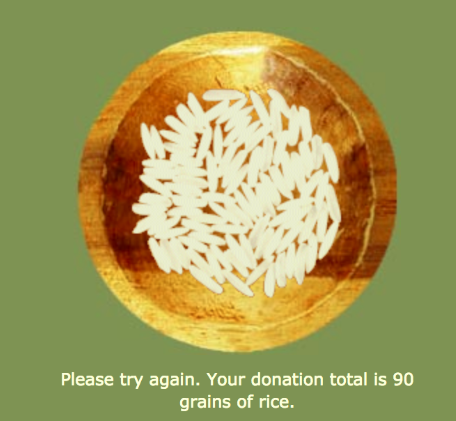 It also brings in practice for their division facts – 90 grains of rice were donated, 10 grains are donated for every correct answer, so how many questions were answered correctly? So, there we are – three purposeful and targeted maths sites that you can use in your programme, all of which can be differentiated. If there’s one you haven’t used – give it a go. Make your use of technology relevant so that it adds value to what you are doing. For more ideas about using digital tools in your maths programme you can read about how to insert maths equations into Google Docs here or you can read Sam’s blog on inserting maths equations into Microsoft Forms here. Just this one word is enough to send shivers down the spine of many people. Mention it and images of crowded, noisy classrooms come to mind. Piles of paperwork stacked high in the corners of decorated, messy rooms flash through memories of many. Strong willed students, numerous scheduled meetings, frazzled teachers, parent requests piling up and plans to be finished all contribute to the picture forming in many minds. But alongside this, what a lot of people don’t see, is the joy on the faces of students when they ‘get it’, the collaborative discussions with colleagues, the long lasting positive relationships that are formed and the lasting impact that is made on the lives of many of our young people. It’s just that teaching is so busy! A very fair and relevant question indeed. I came to realise a while ago that the best way for me to work through the very long list of what needed to be done was to prioritise and then focus on one thing at a time. Everyone’s priorities are different, but everyone knows what is important to them in their position. My priority was always my students – what was it that I needed to do first in order to best meet their needs? Sometimes it was hard to keep this as priority number one as demands and requests from senior management, parents and other teachers could feel like they needed to be dealt with first. Some weeks I was more successful than others with this – but each day was a new day and another opportunity to refocus. It may have been that conversations needed to be had with some colleagues so that they understand and could appreciate what my particular priority was. I am a great list person and this helped with my focus. #GoogleKeep is a great tool for this. 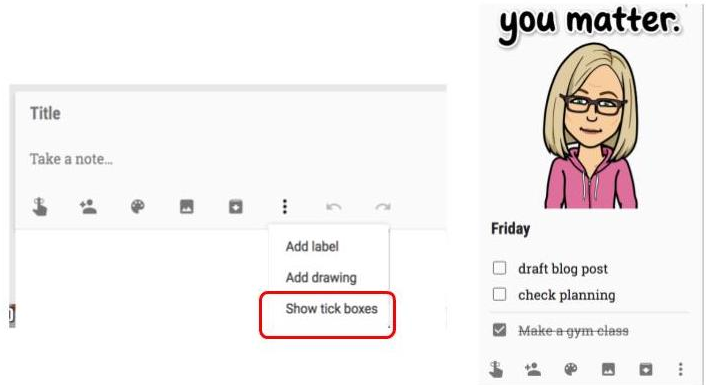 You can create notes that allow you to add check boxes. It’s super easy to tick things off as they are completed – giving me a great visual of how productive I’d been. The new #GoogleTask bar in Gmail is a tool I’ve just begun using also. It sits right in my email view so lets me add tasks to my list directly from my emails. 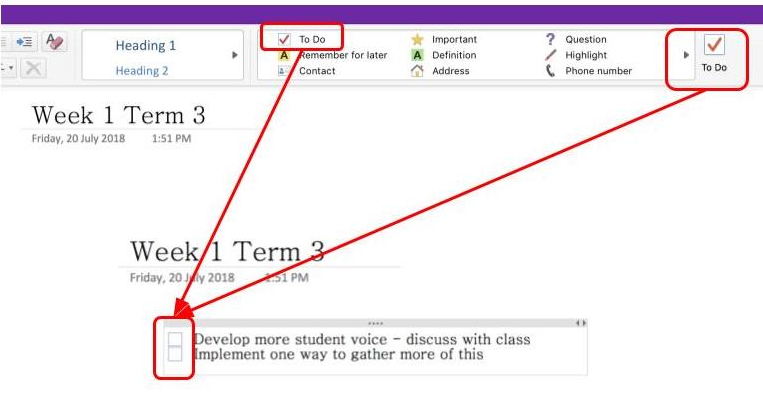 If you’re working within a Microsoft platform there’s a very useful ‘To do’ feature in #OneNote that will help you create a checklist of tasks you want to work through. Aside from checking off the day to day priorities of what needs to be done there’s also the long term pictures. Teaching is a profession of continual learning – there’s always some new tool to investigate, some new Professional Development road that is being embarked upon or some new idea that you’ve seen in your preferred PLN network that you want to give a go. Choose one thing – and again, think of your priority. What is important for you? What is important for your students? Choose one thing and do it well. Doing one thing well, as opposed to doing many things, but feeling like none of them have been done particularly well, is going to bring you much more satisfaction – and provide better outcomes for all involved. 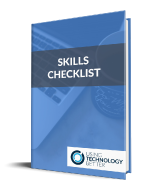 …really came into its own, because there’s always new tools and ideas that could help develop the essential skills for students I was always keen to give them a go. But diving into lots of things and never really developing any one thing fully or to it’s maximise potential just ended up becoming an exercise in frustration. My students couldn’t really feel confident with anything as they felt they were only just beginning to explore possibilities before having to move on to something else. Choosing the one idea or the one tool that best suited what I want to achieve at that point in time – and adding the others to a list ‘To be explored’ at a later date – meant that much more purposeful and successful outcomes were achieved. Sometimes this is beyond our control. A common example is when senior management decide that as a staff you’re going to participate in numerous new Professional Development paths, within the same time frame. At times like this you need to prioritise for yourself – what can you personally focus on fully in order to develop your teaching journey? Don’t park the rest, just priorities your energies and be honest with your senior leadership about what you can personally achieve. If you’re clear in your own mind what your priority is, if you focus on one thing at a time, if you do one thing and do it well, teaching just may seem a little bit less frantic and a little bit more achievable…..give it a go. You just might conjure up a different image in your mind the next time someone says…. For more ideas on managing workloads read Adrian’s blog on Winning Back Time or Sam’s blog on Making Professional Development More Effective. When Stephen Hawking sadly passed away I was in Australia working with teachers on how to develop their use of Office 365 tools. 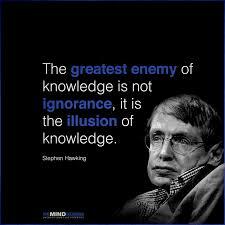 There were many news item about what a brilliant man he was and his quote, “The greatest enemy of knowledge is not ignorance, it is the illusion of knowledge.” popped up numerous times on Facebook over the next few days. As I was working with many dedicated teachers who were so open to learning about new forms of technology, and how these new skills could help them work more effectively, it got me thinking about how we perceive different platforms of learning. In the schools I’ve worked in there has always tended to be a Google v Microsoft mindset. You either have a Gmail account as your email source and you ‘use’ Google, or, you have an Outlook account and you ‘use’ Microsoft tools. When reflecting on Stephen’s quote I began to understand it more clearly: when working with the mindset he was referring to, we tend to think we know what we’re doing. We have some knowledge of the suite of tools we’ve decided to use and so we stop there. We may develop an in-depth knowledge of those Google tools or Microsoft tools and we silently congratulate ourselves for adopting a positive attitude to learning new things. I am not suggesting in anyway whatsoever that this isn’t to be commended. But, because we believe we are doing a great job by developing this awesome knowledge in one domain, it can actually be a barrier to investigating other tools. If we’re a Google school why bother learning about Microsoft tools? If we’re a Microsoft school why bother learning about Google tool? We remain ignorant to the value and benefits of the other range of tools simply because we don’t investigate it. This is what Stephen got me thinking about. He got me thinking that what we should actually be doing is learning about both sets of tools. When we educate ourselves about all the platforms available to us we are better able to choose the tool that is most relevant for the task we want to complete, be it a Google tool or a Microsoft tool. I have always loved Google tools. I worked at a Google school and I spent many hours extolling the virtues of all they could do. During the week that Stephen passed away I was working with Australian teachers and Office 365 tools. I realised I had lots of knowledge about Google, yet there was so much more that I could learn about that would enrich my experiences. I never knew about OneNote simply because it isn’t a Google tool. Had I have taken the time to look outside my ‘Google walls’ I would have discovered a tool that is one of the most versatile I have ever come across. Thank you Stephen for leaving the world with such wise words – I still love Google tools, but I’m now mixing and matching with Microsoft, using what is the best tool for the task at the time – regardless of which camp it comes from. What an inspiring message to pass on to our students – if we could all take on a little bit of Stephen Hawking’s legacy what a better world it would be. If want some tips and tricks on how to use Google and Microsoft tools check out our online professional learning community. QR is short for ‘Quick Response’ and these codes are similar to traditional barcodes. They can store digital information and are scanned with mobile phones and tablets to take the user to the chosen destination. You can create a QR code for any website or cloud document. There’s heaps of free websites that will generate these for you, here’s a couple that you can use without having to sign up. All you need to do is copy the URL of the destination you want to direct your students to, paste it into one of these QR code generators and it will make one for you. You can then download the QR code and print it or place it onto any documents online. There’s a great Google Chrome Extension called goog.gl URL Shortener, which will create QR codes (and shortened URLs) of any page, without having to leave that page. Many smartphones (and newer iPads) now have a QR code scanner built into their cameras, meaning you can just point the camera at a QR code and it will pop up a message asking you if you’d like to open that link. If your device does not have this feature built-in you can download a QR code scanner from your app store. Set up Microsoft or Google Forms that ‘branch’ depending on the answer given. Set up different questions/puzzles and put these as the answers to the questions on the form. Students solve the problem,‘read’ the QR code at the station with their phone or iPad, then the QR code takes them to the form where they can enter the solution – if it’s correct they get the location of the next QR code. You could spread these around your class or around your school. A great alternative to assessments or end of topic review. Make your classroom displays interactive and bring the digital world to your walls. Provide links to more information about your class topics – videos, websites, student created content as well. If you have a set of instructions or information on your classroom wall that all students need to access frequently, you could record yourself reading this aloud (or get the kids to record it). This makes it so much more accessible for those students who may find reading challenging. We know that the process is more important than the product but often it is the product that is on display. When doing a project, get your students to capture the moments along the way with photos, quick audio recordings or videos, then compile these somewhere online (slideshow, video, blog) and generate a QR code for this destination. Put the QR code alongside the displayed product so that viewers can find out more about the learning behind it. This works beautifully with the ‘Design Thinking’ process as well as a great way to make learning visible. QR codes could be used to get your students to check in in the morning. In primary classrooms the QR code might lead them to a Padlet or a Flipgrid where they can take a quick photo of themselves and type hello. This could be displayed live on your screen while students are arriving into your class in the morning. In secondary, maybe it takes them to a Form that they can quickly fill in with their name. This will provide a date stamp and time on the spreadsheet also. This could also direct them to any collaborative documents or notes they will need for the lesson. Often we email parents or send home paper newsletters. We know that this doesn’t always get the best response or attention paid to it. By sending home QR codes you may have more success as parents can quickly scan them with their phones without having to log in or head to their computer. This would be a great way to share student work, gather info about trips or direct them to important information. It will stand out more than an email and you can print several on one page to reduce paper usage. If your students are loving using QR codes they are also much more likely to remember to share it with their parents too! Create a QR code that leads to your class blog or webpage – no need to update the code, just update the blog. Put it on your class window, parents who are waiting to pick up their students can open it up and have a look while they wait. Send one home at the start of the year, laminated, with a magnet on the back, and encourage students to put it on their fridge. Share answers to quizzes and tests with QR codes so that students can easily mark their own work. Using a QR code means that they are hidden until needed. There are so many ways to use a QR code in your classroom. You’ll probably find that once you start using them your students will begin including them in their assignments and tasks as well. At the start of a school year, everyone is fresh from holidays and there is an air of enthusiasm in the school. How we start a year paves the way for the next 40 weeks. I used to jump right in with not much thought about the start of a school year and technology. A device was issued, maybe there was a discussion about cyber safety and then the floodgates opened. If I had my time again I would follow these five steps. Don’t turn on the device. Establish agreed rules of engagement. Build a list of key ways to save battery life. Teach how to watch a video for learning. Teach how to search efficiently. Step 1 – Don’t turn on the device. Step 2 – Establish agreed rules of engagement. 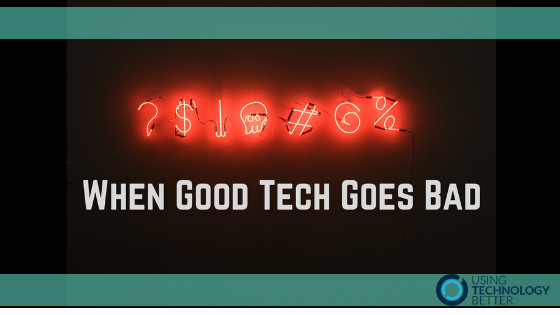 Setting aside some time to build a code of conduct in relation to the use of technology in your class is time well spent. It helps everyone be on the same page and can reduce conflict in the future. Many schools have a generic one for the whole school which can be personalised for your class. Such things as ‘screens down during discussions’ can really help in the long term. Step 3 – Build a list of key ways to save battery life. A flat battery not only disrupts your class, but it can prevent a student from learning efficiently. Build a list of tips to save battery life and post them in your classroom. Turning down the brightness of your screen. Turn off backlit keys (they look great, but drain power). Adjust the settings so that the screen, hard drive and processor goes to sleep after 5 minutes. YouTube uses a lot of power, so monitor and minimise the number of clips watched until you can plug in. Disable Bluetooth unless you are using it. Turn off apps that you aren’t using. Sometimes apps run in the background and constantly drain power. Reduce the number of tabs open in your browser. Use an extension like OneTab or Too Many Tabs for Chrome. Use your devices battery saver feature, if it has one. Step 4 – Teach how to watch a video for learning. Pause the video to take notes or sketchnotes to capture the key points. Read the notes and make sure they understand the concepts. Re-watch the video to see if they missed something. I would do this as a class activity, then set it as a homework task and discuss what was learnt from the video. Occasionally during the year, I would revisit these skills. The time spent at the start of a year teaching and modelling these skills will definitely pay off in the long term. Step 5 – Teach how to search efficiently. When posed with a question, we often say ‘just Google it’. Search is an amazing tool, but seldom do we as teachers understand how to get the best results and how to use it well. The start of the school year with technology can be messy, but by following these five steps your journey may be easier. Also, the relationships you build with students will create a sense of community and, belonging with technology assisting learning. Have you got any other tips you could share? If so please add them to the comments section.